Nearby there are Konyushennaya Square, a Temple The Savior-On-The-Blud and all the most known sights of historical Petersburg. This apartment consists of a drawing room and one bedroom, kitchen and a bathroom. 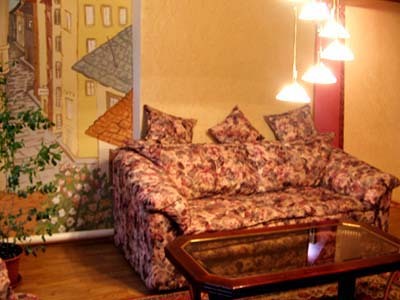 The apartment is designed in classical style, it was recently renovated, there is a modern comfortable furniture. There is very cosy, warm and quite. Berths: there is a king-size double bed in the bedroom, a folding double bed in the drawing room. There you have all needed home appliances such as TV, phone, iron and ironing desk. The kitchen is completely equipped by household appliances - refrigerator, washing machine, gas cooker, microwave oven, there is all necessary utensils. Bathroom is comfortable, equipped by high expirienced sanitary technician. It includes the bath, a toilet bowl, a bowl, a gas water heater. Entrance is from Bolshaya Konyushennaya street, under an arch of the building 7, through a court yard. A court yard is green, well-groomed, silent.